The Top 10 Most Memorable Mommy Hiker Moments of 2013 – A Year in Review! Starting this blog has inspired me in so many ways, it’s virtually impossible to put into words, but given that this is a written medium, I’ll give it my best shot! It’s hard to believe that it’s only been a year! It blows my mind and sends chills down my spine to look back at all of amazing experiences we’ve had, new friends we’ve made and all of the incredible stories that have been told here. Our love for hiking, camping, traveling and adventuring out to discover this bright, big world is our passion. This passion has blossomed into a thriving community of families and collaborators whose sole wish is to get outside, get dirty, explore and discover the pure magnificence of Mother Nature in all of her glory. I have learned so many invaluable lessons of life, creativity, serenity and love and for that, even a thousand thank yous seem inadequate. And yet, I’m left with that. It’s been an honor to share a bit of our life with you and I want to thank you for sharing a bit of yours with us! Thank you! Thank you for reading. Thank you for sharing. Thank you for inspiring me. And thank you for, in turn, inspiring others! And now…..on to our Year In Review! Here are my Top Ten Most Memorable Moments of 2013! #9 | Family Volunteering with TreePeople! Learning how to carefully plant seedlings in the scenic Cienega Sin Nombre valley of Calabasas was a great outdoor activity to teach V the value and importance of restoring habitats that have been destroyed by urban sprawl in invasive non-native plants. #8 | Finding Beach Bliss in Oxnard! I love discovering a new favorite place and the beaches of Oxnard are certainly a new fav! The peaceful and quiet pace you’ll experience there is a refreshing contrast to the throngs of transients and tourists you’ll find at most of the local Los Angeles beaches. #7 | Hiking Malibu Creek! Malibu Creek State Park is a whole day excursion, loaded with a wide array of nooks and crannies just waiting to be explored! 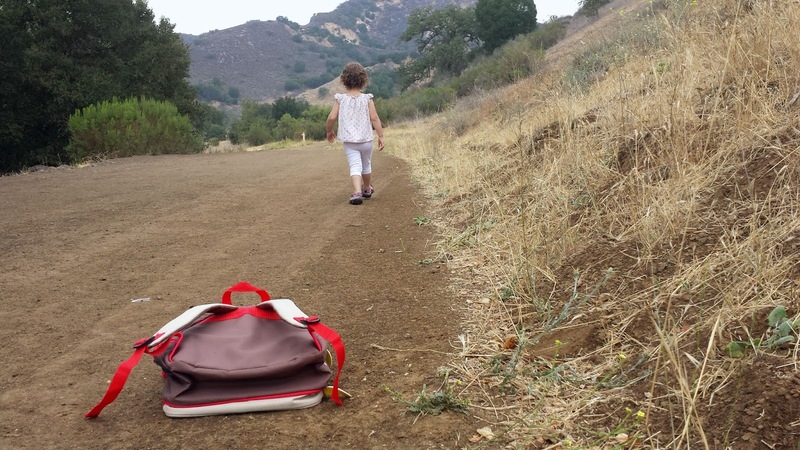 Hike, swim, picnic, climb, caves, it seriously is all that and a backpack! #6 | thinAddictives’ Mommy Hiker Spotlight! It was a huge honor to have been recognized and placed into the company of such accomplished and victorious women. Definitely a proud moment of 2013. #5 | Star-Gazing and Sharing Secrets! Life is made up of little, shining moments, overflowing with the pitter patter of little heartbeats and the warmth of a breath on a cheek as little mouths tell made up stories, full of wonder and amusement. Star gazing was full of these perfect, still moments. #4 | Learning Life Lessons from the Alpacas! Doesn’t get much better than watching life come into the world. Witnessing a mother nuzzle her baby for the very first time, observing the trust and tenderness between them and sharing it with my daughter was, indeed a beautiful life lesson. #3 | Setting Sail on a Channel Island’s Wildlife Cruise! This was literally one of my favorite days of 2013! This trip was chocked full of first time experiences for our entire family. We learned so many amazing things, saw wildlife basking in their gorgeous habitat and we are headed back in 2014 for sure, to explore the island’s terrain and trails even more by foot. #2 | Exploring Big Sur! The Land of Supreme Beauty! We spent four nights under the lush green canopy of Big Sur. Hiked its trails, sat next to its creeks, sketched its every detail and came home with memories to last a lifetime! #1 | Hiking & Hijinks in the Majestic High Sierras! This was hands down the best camping trip with our toddler to date! It has been thrilling to watch V transform from one trip to the next (this being her fourth camping trip). She really came into her own during our week-long stay in Sequoia and as camping parents, so did we! What I’m most looking forward to in the coming year is camping, watching her grow and bloom, surrounded by the safe and loving hands of Mother Nature. I can’t wait to see what treasures and travels await us in 2014 and I can’t wait to share them with you! Gosh so many wonderful outdoor family trips. Love your blog! Look forward to reading more in 2014. Happy New Year! I can certainly see why these are your top 10, such fantastic adventures and memories. Thanks for linking up and joining in with Country Kids and I hope to read more about your outdoor fun in 2014.